What Does a Health Care/Hospital Administrator Do? Health care administrators manage hospitals, clinics, nursing homes, and other health care facilities. They also work for public health organizations, pharmaceutical companies, and other organizations involved in health care. The field also includes managers of specific departments, such as admissions, or supportive roles. People generally join the field directly, rather than moving up from positions involved with patient care. 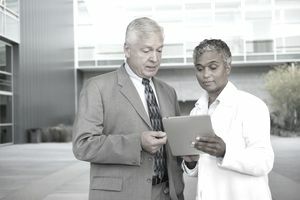 Administrators at hospitals or elsewhere in the health care profession often are responsible for overseeing the entirety of business operations, or they are responsible for overseeing a key department such as records or finances. Responsibilities are similar to those in other management roles. Administrators are responsible for establishing, approving, and adhering to budgets. They set the tone for the facility by overseeing the hiring of staff and the establishment of goals and priorities, and they often represent the facility in the community or in meetings with other business partners. The job differs from other administrative roles because of the specific nature of health care. Facilities must maintain precise records and protect patient privacy in accordance with federal regulations and work closely with doctors and health care professionals on staff as well as with insurance companies. Demand for administrators with knowledge and experience in the health care field helps boost the median annual salary in this field to about $10,000 per year more than what administrators in other fields earn. Education: A bachelor’s degree is enough to get an entry-level job in the field, but advanced degrees are likely to be required to manage a department or an entire facility. Master’s and doctorate programs also are possible in health management or public health administration. Experience: Even before finishing any kind of a degree program, experience in a hospital, nursing home, doctor’s office, or other health care facility will be considered beneficial. In addition to hard skills and on-the-job experience, certain personal qualities or soft skills are important for healthcare administration positions. Communication: Leadership is a big part of being an administrator. For health care administrators, that requires being able to communicate with doctors and others providing direct care to patients and serve as a link between that hands-on care and the business and financial realities of running a facility or a department. Highly organized: Administrators in hospitals or other health care facilities need to keep track of finances, records, changes in insurance or health care regulations, and much more. Staying on top of all these issues requires someone to be detail-oriented with strong organizational skills. Problem-solving: As in any management positions, things do not always go smoothly, and it often is up to an administrator to find a solution when that is the case. Critical/analytical thinking: It’s important that health care administrators be able to analyze everything from facility finances to processes for billing, record-keeping, and more. Opportunities for health care administrators are expected to grow at a rate of about 20 percent for the decade ending in 2026, according to the U.S. Bureau of Labor Statistics. This is nearly three times the 7 percent rate of growth projected for all occupations. The growth is attributed to an overall increase in demand for health care services, which leads to an increased need for managers to oversee records, finances, and other administrative duties. Health care administrators might work in hospitals, nursing care facilities, private practices, or any place where health care is the focus. Though such positions are in the health care field, the work typically is done in an office setting, handling administrative tasks as opposed to playing a direct role in patient care. The U.S. Bureau of Labor Statistics reports that about 30 percent of medical and health services managers work more than 40 hours per week. This is not atypical in administrative positions, as responsibilities often lead to late hours. In health care facilities that are open during evenings and weekends, administrators might need to work during those times occasionally. However, normal business hours are more common for administrative positions. Health management or public health administration are recommended degree paths. Any experience working in a hospital, doctor’s office, or elsewhere in the health care field will be beneficial. To advance to a high-level administrative position, a master’s degree or a doctorate likely will be expected.